It is around this time every year that my classroom to-do list starts looking a little lot overwhelming. I tried separating my lists into different categories like "Classroom Set Up" and "Academics" and "JUST GET IT DONE!" but I still felt like I had all of those things left on my to-do list, and I needed to get them done before school started. Now I'm learning, slowly but surely, what really needs to be done ahead of time and what can wait. I've been brainstorming this list for weeks, trying to figure out the best advice to give you. These recommendations are based on my experience in the classroom, and I know that everyone will have different opinions on them. Take this advice with a grain or two of salt and share your additions (or arguments against my advice) in the comments. I'd love to hear YOUR thoughts on what can and can't wait as you prepare your classroom. DO Have these things ready before the first day (or the first time you will be meeting with parents). Make sure you have a plan in place for how you will communicate with parents. Know the answer to all of these questions before you meet with any parents. How can parents stay up-to-date on what is going on in the classroom? Will you have a newsletter, a blog, a website or wiki, a homework book, a student planner, a behavior log? If you are going to have a newsletter, how often will you send it home, and where can parents expect to find it? Will you send home graded papers on a daily basis, or in a Friday or Monday folder? What is the best way for parents to contact you if they have a question or concern? How can parents expect to hear from you about a child's behavior, good or bad? Will you call them directly, send them an email, or send a note home in their backpack? Think through how you want to handle homework throughout the year. Here are some questions to ask yourself. These are ALL questions that students and parents have asked me at least once. In addition to "standing" weekly homework, will you send home unfinished work with students to complete at home? Do you plan to have students complete any projects at home? If you plan to have them do book reports or math projects at home quarterly, be upfront about that so parents can plan for those additional activities. How will you communicate about homework to parents AND students? Will you have the class write in a student planner at the end of each day or are students responsible for writing homework down on their own? Are you going to have parents sign planners every day? Is there a homework folder that students need to put homework in? How do you grade homework? Completion? Accuracy? What is your justification behind the way you are grading? What is your late policy, and what are the repercussions if homework is not turned in on time? Where and when will students turn in homework? Before students walk in the door, have a plan in place for how you will reinforce positive behavior and how you will redirect negative behaviors. Are you going to have a clip chart system for individual behavior? How will you reinforce positive behavior and what are the consequences for inappropriate behaviors? What do students do AS SOON as they walk in the door? Make sure you are prepared to set that expectation from the very first day. Do you have something that students can reference if they aren't sure of what to do in the morning? Consider having a list of things to do "When You Arrive." What do you have in place to make taking attendance easier for yourself? Create some system that requires students to do something to show that they have arrived. When students finish morning tasks (like making lunch choices, turning in homework, sharpening pencils, etc.) what should they be doing? Most people refer to this part as morning work. Make sure your students don't have even a second to get off task. I mentioned this in my Meet Your Teacher Night post, but make sure you have a plan for all of the supplies that will be coming into your room. This will not only save you a little sanity on the first day of school, but for the rest of the year, too. Will you have community or individual supplies, or a mixture of both? What procedures will you have in place for handing out supplies that aren't already at student desks? Where will you store extra supplies (especially big items, like tissues, Clorox wipes, or Ziploc bags) so that you can easily access them? If a student walks in with a backpack full of supplies on the first day of school (or at Meet Your Teacher Night), what should he do with them? Make sure you decide ahead of time what notebooks, folders, or binders you will be using for which purposes. If you are lucky enough to request supplies from parents, chances are you have already decided this. Regardless, make sure you know if you want all of your students to use the red folder for homework and the yellow folder for math, etc. This will help you in the long run, but if you don't plan ahead, you won't have as much opportunity to be as organized. If a student finishes early, what can he or she do? I have talked a lot about the importance of planning for Early Finishers, but I can't stress the importance of this on the first day of school. I mentioned earlier in the post to not let students have a free moment on the first day of school. Inevitably, though, students will work at different paces, and you will need something to keep those early finishers occupied in a meaningful way. Explaining early finisher activities should be on your list for discussion on the very first day of school! Yes, your schedule will change a lot throughout the year, and we all know that no day is ever really the same. However, do your best to have a "typical" schedule ready to go for the year so that you can follow it on the first day. It's all about setting expectations for the rest of the year, and the first day makes such a huge difference. If you plan to implement math workshop, try to have at least some semblance of that on the first day, even if it's just exploring math manipulatives in groups. Consistency is key! Now that I've given you a list of things that you should have ready to go before the first day, there are a few things that I have found are less important than they seem. These are things that I used to focus heavily on, but I now see that they aren't quite as big of a deal to work through before school starts. By all means, if you have extra time, these are things you might consider getting worked out ahead of time, but if you have 100 other things to do, in my humble opinion, you can save these for last. Seating Arrangements. Find a suitable seating arrangement (are you a row person or a group person?) that will work for your needs for the first week of school. Find the arrangement that will fit within your classroom, but don't spend hours upon hours thinking through the possibilities. The reality is that it will probably change a dozen times throughout the school year based on your class or the unit you are teaching. Decorations on the walls (including the halls). I always start the year with borders on my walls and in the hall, and that is pretty much it! I wait until I have student work, anchor charts, and other meaningful, classroom-created products to hang in the halls. When students and parents arrive, the classroom looks clean and ready for student work to grace the walls! Name Tags (for the big kids). I used to spend the night before school started writing names, laminating, cutting, and taping student names on those big, fancy reference name tags. And, probably at my own fault, the students never used the references on those name tags, and we had to take them off for testing anyway. With bigger kids (grades 3+), I always have students put a sticky note on a desk of their choice when they come to Meet Your Teacher Night (which usually happens a few days before school starts). If a student does not come that night, I place a sticky note with their name on it on one of the empty desks. When they arrive on the first day of school, we spend part of the day making our name tags. I laminate them that night, roughly cut them out, let the students finish cutting them nicely, and tape them to their desks the next day. They LOVE it! This giveaway is over, but hop on over to each of these fabulous resources to check them out! Be sure to stop by all of our blogs to see the different Smooth Sailing Tips and Tricks we have for you as well as enter to win their awesome drawings, too! Remember that every time you enter into one of the drawings, you get another change at the GRAND PRIZE drawing! Wow this is awesome. I love your blog! Would love to win. How do you enter? A blog comment? Thanks! There are some great tips here. In my school over here in England a lot of the questions you are asking yourself (newsletters, homework schedule etc.) are all dictated by whole school policies. One of the greatest organisation things I have learned since I started teaching is to have a marking timetable. It makes life sooooo much easier! I'd love to hear more about your marking timetable! Grading papers is the bane of my existence! One of the things I try to make sure I take care of prior to students entering my class is getting all of their paperwork straight - IEPs, 504s, accommodations, etc. Our school will sometimes get this information to us, but since we're departmentalized they don't always give me my other class's information. I make a point of hunting that down before Meet the Teacher so I can address any parent concerns. 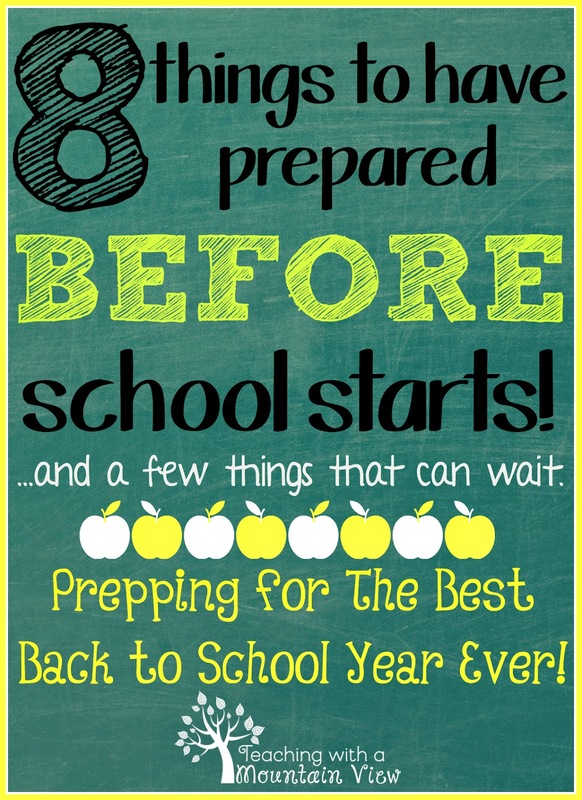 Love your 8 things to prepare! I totally agree with all of them! Love the logical thought behind this. A few weeks before school starts, my brain is generally oatmeal and I can't think clearly. Thanks for the reminders! Thanks for your help with keeping things in perspective and for a terrific giveaway! This is just SO FANTASTIC! I reworded my Open House Powerpoint (not sure if I present to parents or not) but otherwise I will print it out and give it to students as a copy of policies. Those are all questions parents want to know first and transitioning from Kindergarten I had forgotten about many of them but now that I have them nailed down I feel more confident with parents and how many classroom will run. Thanks for the great reminder!!! Fabulous tips - Thank you! For nametags, I always laminate with number (in upper corner) but no name. For the first week we use temp. nametags, then after the first week I'll write students' names with the correct spelling/nickname/etc. using a Sharpie. That way if a new student comes in the first week I can plug them in the ABC/123 order. After the first (solid) week new students just go at the end of the list. It also helps with the correct names. I've had a few years where Elizabeth, wants to be called Libby or Beth and parents have approved. Good Luck SY 14-15! LOVE your Blog & ideas!!!! THANK YOU for sharing and entering me in the drawings/contest! Have a fabulous school year!! Just checked out the Early finishers post. LOVE IT! This is exactly what I needed to hear! "Permission" to not worry about every detail and have everything Pinterest perfect on the first day. I'm in a new building/district/grade this year and have felt a little crushed by everything! Thank-you! !